Bahrain: Paediatric diabetes in Bahrain is increasing at the rate of seven per cent a year, with almost 8,000 children under the age of 14 treated at Salmaniya Medical Complex (SMC) last year, it was revealed. Type I and Type II diabetes were both on the rise in the kingdom, said Health Minister Faeqa Al Saleh. She was speaking at an event at the Health Ministry in Juffair to raise awareness on World Health Day, which was marked yesterday under the theme ‘Beat Diabetes’. “Type II diabetes, which is associated with unhealthy lifestyles, is a big problem as it affects a large number of people in the community and is on the increase. “In the last survey of non-communicable diseases, the rate of diabetes in adults aged above 20 was about 14.3pc, which rises to more than 20pc if you include those at risk. “Statistics also indicate that the number of new Type I diabetes cases is increasing in children in Bahrain, as is the case around the world. “In the last 10 years, the number of cases rose from eight to 23 per 100,000 births a year. “The ministry has sought to frame policies and procedures for care of diabetic patients and has worked to improve the quality of care provided. Paediatric diabetes specialist nurse Ebtisam Alajmi told the GDN that there was a “significant number” of children aged between five and 14 with Type I diabetes. “There’s about a 7pc increase in Type I diabetes in children every year,” she said. “We have a lot of cases in children five years and above – I’d say it’s equally dispersed in that age range. 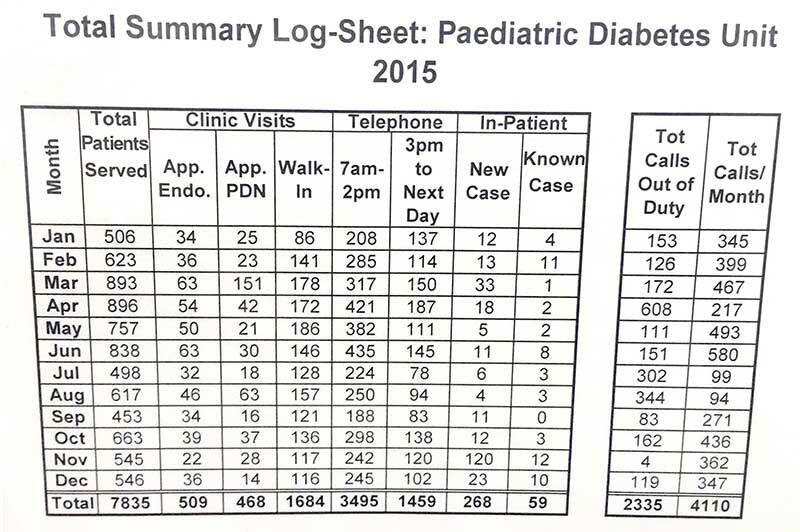 “Last year, the Paediatric Diabetes Unit served 7,835 patients in total, split over clinic visits, in-patient treatment and phone calls. At yesterday’s event, the nursing team outlined the strengths and issues of the unit to Ms Al Saleh. “We told her some of the problems we face at the clinic, which include not having a proper place to sit and teach the children,” said Ms Alajmi. She also said that some patients struggle to find funds to buy an insulin pump. “Earlier, diabetics would be forced to have six checks a day and use four injections, which was stressful and led to complications,” said Ms Alajmi. “But with the new pump, they just wear it and it dispenses the insulin. “We need to have an awareness drive on how to use the pump. “The German-made device, which is the best, costs around BD2,300. Nearly 200 people had their blood sugar levels checked at the event which was organised by SMC outpatients nursing head Badriya Duaij. It was attended by assistant under-secretary for hospital affairs Dr Waleed Al Manea and assistant under-secretary for training and planning Dr Mohammed Al Awadhi. Another event has been scheduled for Tuesday at the SMC. For the paediatric diabetes hotline, call 36840404.